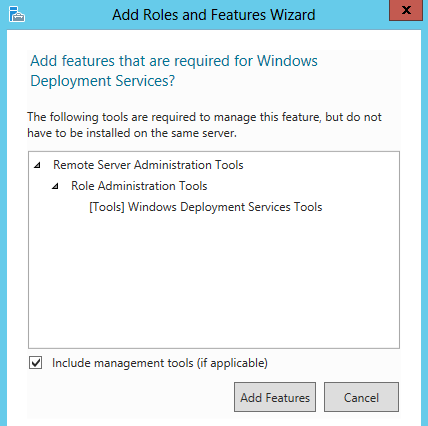 In this tutorial Windows 2012 server is used, but the concept stay the same on older version. In computing, the Preboot eXecution Environment (PXE, sometimes pronounced as pixie) specification describes a standardized client-server environment that boots a software assembly, retrieved from a network, on PXE-enabled clients. On the client side it requires only a PXE-capable network interface controller (NIC), and uses a small set of industry-standard network protocols such as DHCP and TFTP (source wikipedia). 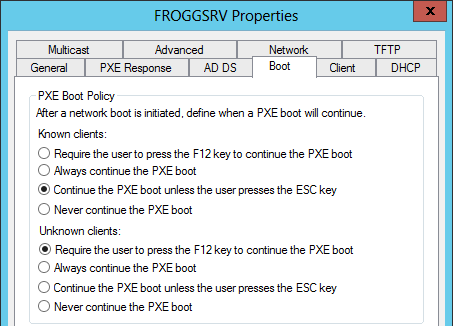 TFTP is included in Windows DHCP, you just need to enable PXE Client in DHCP console in server options. - Clients require at least 256 Mo of RAM & a network card. - Client Computer require Network booting option. Some network card (most of the time really old and low cost card) don't have network boot option. In this case Network booting is impossible without changing the network card. Some BIOS (most of the time really old and low cost motherboard) don't have network boot option. In this case you can try to update BIOS or give up with it ! I use the stand alone option cause i don't have Active Directory installed on my domain. 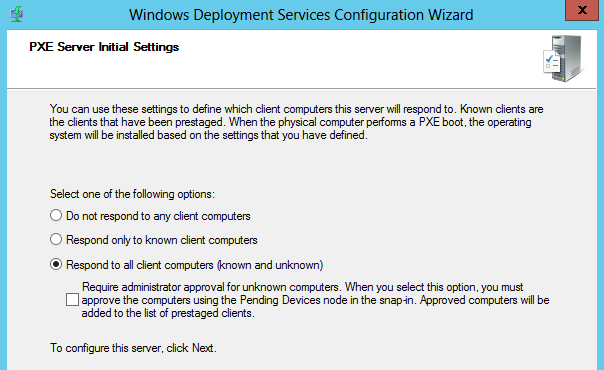 If you have Active Directory enabled, you may choose the first option. For the next part of tutorial "E:\RemoteInstall" will be used as WDS file folder, but you can adapt it according to your configuration. 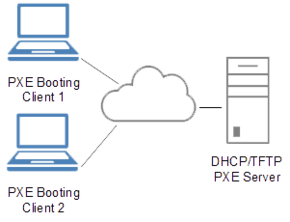 Thoose options are checked because DHCP and WDS are on the same host, uncheck thoose options if the DHCP is running on another server. Respond to all client computers is not advisable in most of networks for security reason, as i use it in home local network enough securized i can choose this option. Most of the time for security reason only know client computers or require administrator approval options should be selected. By default, even with WDS PXE enabled, it won't works, a default bootable Windows Imaging Format (.wim) file (most of the time called "boot.wim") is required. To add a boot image you have to use WDS console. you need to add a boot.wim for each architecture you need (x86 and x64 for example), select the boot.wim from an Microsoft OS with the desired architecture type. for this tutorial i use the package syslinux-6.03.zip, i also tested syslinux-4.07.zip and both works the same way, so this tutorial should works also for old version. pxelinux.0 is used to start linux PXE boot. 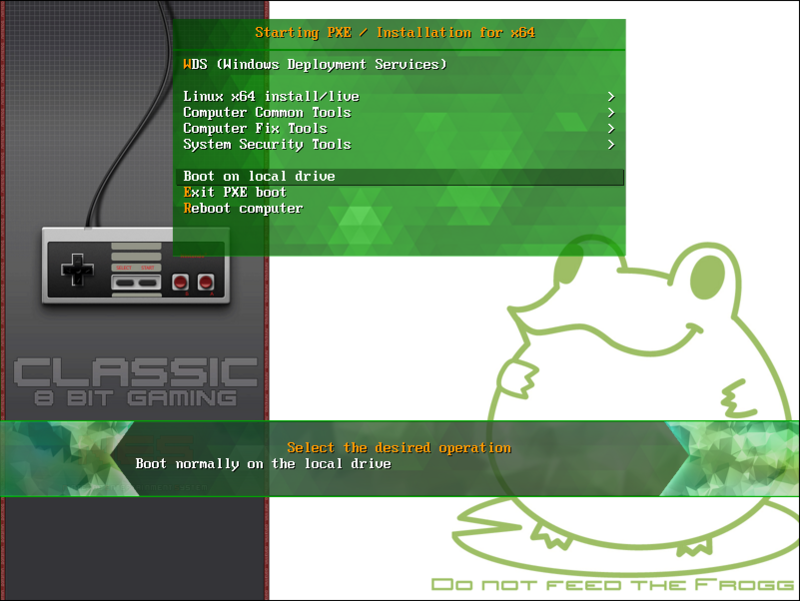 menu.c32 is a comboot module for Syslinux that renders a menu on the screen. vesamenu.c32 is a comboot module for Syslinux that renders a customizable menu on the screen (i think it work only on x64 system, i didn't had it works for x86 computers). chain.c32 is a COM32 module for Syslinux. It can chainload MBRs, partition boot sectors, Windows bootloaders (ntldr, setupldr.bin and bootmgr), MS-DOS and PC-DOS io.sys, Freedos kernel.sys, isolinux.bin (only from ISOLINUX), grldr of grub4dos or a bootsector saved to a file. It can also swap BIOS drive numbers or hide partitions. reboot.c32 (optional) is a COM32 module for Syslinux that is able to reboot the PC. It supports cold and warm rebooting. poweroff.c32 (optional) is a COM32 module for Syslinux that is able to shut down the PC. PXE Linux boot should now works, you can test it using a client computer with network boot. "Initial menu has no LABEL entries!" There around 3 ways to add bootable operating system. In this part, I will use some common free operating system as example. This way is the easiest way for implementation. it can works with .img too. - Image iso/img will be sent to client and then uncompress, so it take a lot of client memory to load and lot of bandwith to transfert. - The transfert will be by TFTP which is slow. - This way is the most common for debian based system. To be more precise, it is not really PXE but Syslinux configuration file, PXE is the whole boot process. since version 2.4.2-10, the option "union=overlay" has to be added to have it work, else an error "clonezilla mounting aufs on /root/ failed no such device" occure. Some of thoose configurations are set to use french keyboard & language (fr) you can remove thoose parameters or change it for your language. stuck on copyright "Peter Anvin et Al"
You may have a trouble in your linux pxe configuration file, for exemple a bad use of INCLUDE can make infinite loop. Try to comment some part of code until Linux PXE screen boot, you may find the problematic line. If you use ^ before menu first letter, they hahe to be different else MENU DEFAULT won't works. You probably mixed files, you need to use all files from same syslinux archive, if you use file from 2 differents packages you might get this error message. Download stop because client computer memory is too low ! 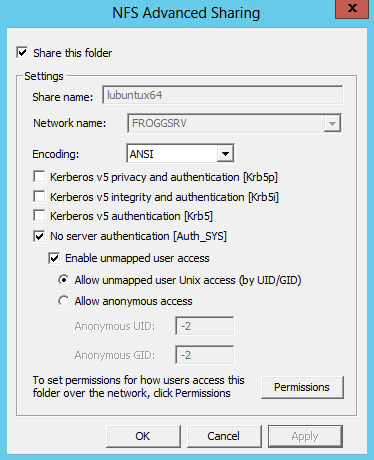 By default IIS allow only some kind of extensions. 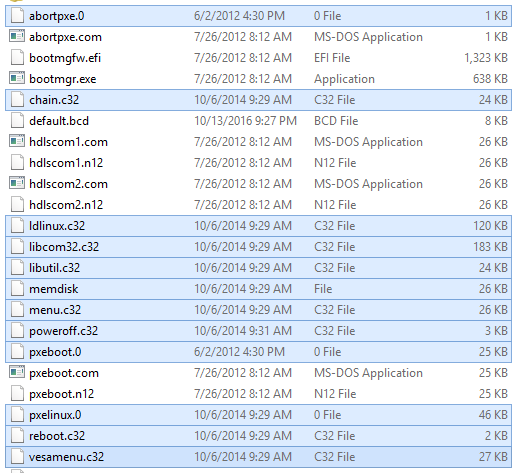 You may need to allow .squashfs extensions (and maybe .md5 &.dat for some case). Is There A Way To Define Constants Or Variables? At present, there is no way to define constants or variables in the configuration file. That feature will be added eventually. 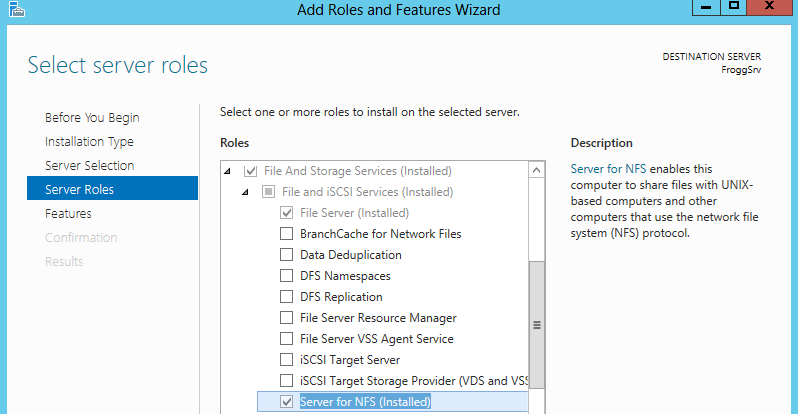 How to enable NFS on Windows ? 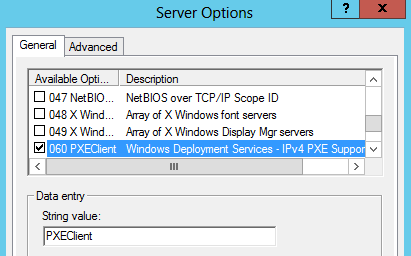 Can i change WDS boot option for clients ?